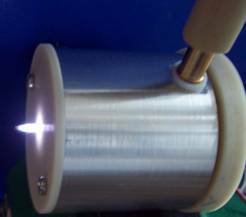 Experimental model of a plasma jet generator operating at atmospheric pressure. The supply electrical circuit consists of two voltages sources parallel connected. One of them is a high voltage pulse generator (Upeak=-4kV, f=1-100Hz) whereas the second one is a conventional dc voltage source (for normal operation, adjustable in the range from -600V to -1000V). After the plasma plume is initiated, the electrical discharge is sustained only by dc source. This approach improves the circuit supply reliability, energy efficiency and diminishes electromagnetic perturbations. Its design is based on commercial available components, allowing to be implemented as a product by an innovative start-up. O. S. Stoican, High voltage pulses circuit for generating a plasma plume at atmospheric pressure, 17th International Conference on Plasma Physics and Applications (CPPA), June 15-20, 2017, Bucharest, P3-04, p88.